Weighing up dental implant pros and cons can be a complicated business! If you are missing a tooth, or need to get a tooth pulled, you may have thought about getting a dental implant as one of your possible options to replace the tooth. I have found that there is quite a bit of confusion about dental implants in most patient's minds, mainly because dentists don't always explain things clearly enough. And dentists always seem to be more interested in some scientific or technical detail that means nothing to the potential patient! So if you're trying to weigh up dental implant pros and cons, I hope I can help to clear things up a bit. First of all, what exactly IS a dental implant? I describe it as being like an artificial tooth root. That's all it is, when you boil the whole thing down. It's just a replacement tooth ROOT. Not the whole tooth. Only the root. The bit of your tooth that is hidden under the gum. I find that patients are very often surprised when they see the full length of a natural tooth root. It's much longer than they thought. I suppose you could say that a tooth is a bit like an iceberg - you only see a small part of it, but there's MUCH MORE underneath! In the image above, which is an X-ray of a patient's teeth, there are four "teeth" visible. It's actually a bridge. The interesting bit is the upper half of the image. On the right side is the dental implant, which has a solid white appearance here. 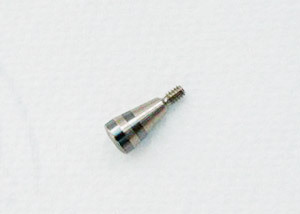 You can also make out the screw threads on it.To the left of the implant is a natural tooth root, with a root canal filling. Further to the left is a natural tooth root. A typical tooth ROOT (the bit under the gum) will be approximately one to two centimeters long. There is quite a lot of variation between the different teeth and between different people, but that's a rough figure. Generally speaking, a dental implant will not need to be as long as this, because they are usually slightly fatter than a natural tooth root. What's important here is not so much the length as the surface area of the "root". A dental implant can have a greater surface area than a tooth root because it is fatter AND it is grooved, with a spiral thread running around it. And they are usually sand-blasted as well, which increases the surface area even more, especially on a microscopic level. So let's get back to looking at dental implant pros and cons! SO WHAT POSSIBLE ALTERNATIVES ARE THERE? 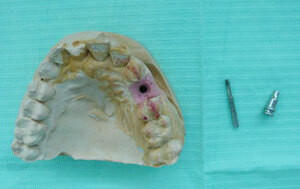 First, there is always a small removable part denture. You may even need one if you get a dental implant, during the healing phase. Next, there is (maybe) an adhesive (also known as a Rochette or a Maryland) bridge. Finally, there is the conventional fixed bridge, held in place by a crown (cap) either side of the gap. So what are the plus points to getting a dental implant? You can replace a single tooth without needing to involve the neighboring teeth in any way. You don't need to trim down the next-door teeth like you do for a fixed bridge, and you don't have anything sitting on the gum next to them like you do with a removable partial denture. A dental implant is a completely separate self-contained artificial tooth root. Dental implants can also be used to support several things; a single tooth, two teeth on one implant, a bridge of three or four teeth on two implants, or even "dental implant dentures", where you still have a full denture, but it is held in place securely by 2 to 4 implants. There is a technique for replacing all the teeth in one jaw called "All On Four". What are the disadvantages to getting a dental implant? The first thing on just about everyone's mind is the cost. There's no doubt about it, a dental implant is the most expensive way of replacing a missing tooth. It is roughly twice as expensive as an equivalent fixed bridge. BUT this will vary from country to country, and dental office to dental office. Next, people are concerned about dental implant pain. How uncomfortable is the whole procedure? In a straightforward case, without complications, getting a dental implant involves about the same degree of discomfort as getting a tooth pulled. More or less. That holds true for the surgical implant procedure itself AND ALSO the level of discomfort that you will experience during the healing phase afterwards. Complication is something that is not often talked about. 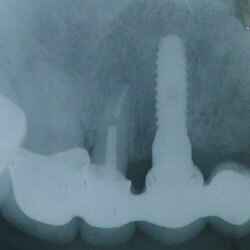 When complications crop up with a dental implant, things can go downhill quickly. There are so many factors that have to be in your favor, and so many things for the dentist to keep a track of, that it is some sort of miracle that dental implants work as well as they do! But you have to be prepared for dental implant complications to arise. You even have to be prepared for an implant to fail, and have to be removed. This is rare, but it DOES happen. The other main complication is nerve damage during the procedure, resulting in either limited sensation in the area of the implant OR possibly complete and total numbness of the lower lip and tongue on one side of your mouth. Time required. Getting dental implants is a time-consuming business. You need to be prepared for many visits to the dentist's office. Sometimes these appointments will be long ones, for surgery. Most will be shorter ones, to check how the dental implant healing is coming along, taking moulds, checking your bite, and finally fitting the new teeth. But there's no getting away from the fact - dental implants are NOT a quick fix solution! You MUST be prepared for things to take longer than you might want. Modern dental implants can be a fantastic solution in many cases. But they do have some drawbacks of their own, especially cost, complexity, length of time needed, and possible complications and failure. Dental implant pros and cons should be discussed with your dentist, implant surgeon or whichever specialist is planning your dental implant. Pros and cons must include all the risks and alternatives as well as the benefits - otherwise the dentist could find himself on the wrong side of a Dental malpractice attorney! Overall, they are frequently the best option, from a technical point of view. You just need to know about (and accept) the small percentage of problems that they can have, too.